Failing to maintain a clean and clear drainage system in your home could lead to a clogged drain and a number of frustrations. Some issues can be annoying, while others could lead to major damage in your home! Not only can clogged drains cause minor problems, like your water not being able to go down the pipes, but if ignored long enough it can also result in much bigger problems such as water overflow damaging all your belongings in the area. When it comes to issues like this though, sometimes a good declogging liquid just won’t do—and when that time comes, you’ll want to call Midwest for any and all clogged drain repairs. Don’t allow your drains to build up gunk and filth, contact Midwest today for all your drain repair needs! We offer expert drain cleaning services at an affordable price. Our licensed technicians can provide preventative drain cleaning services, as well as emergency service for clogged drains. With 24/7 availability, it’s always the right time to call on our team! To be sure we stay the market leaders in drain cleaning, our team is constantly undergoing further training to keep up with the latest trends and technology. We offer upfront pricing and keep our rates consistent. When you call us, you can expect clean, knowledgeable, experienced, and courteous service. You can rest assured that you will not only have a knowledgeable and professional team at Midwest working for you, but that we can do just about any drain repair. We offer upfront pricing and keep our rates consistent. Slow draining – If you notice that the water is going down, but it’s slower than it has been before, this is an indication that you need drain cleaning. Drains can clog up with things like grease, debris, toothpaste, soap, and hair. Blocked drain – If you have a drain that has water sort of sitting on top of the plunger, then you need drain cleaning performed on your pipes. This could be a kitchen sink, bathroom sink, or even a tub or shower. Overflowing toilets – One of the worst, this is another sign that you need drain cleaning. When this happens it’s usually because there is a blockage from either too much waste or a foreign object has been placed in the toilet and flushed down. This is usually attributed to napkins, baby wipes, too much toilet paper, or even large amounts of feces that didn’t break down. Foul smells – These are never a good thing, but if you notice them in your toilet after flushing or before using, in your garbage disposal or sink or anywhere else in the house, this could be a sign that you need drain cleaning services. Odd noises – If you hear odd noises like gurgling or sloshing, chances are the water is trying to go down the pipe but it can’t because of an blockage. A clogged drain can seriously ruin a mood. You just wanted to wash up or clean and you end up with a clogged drain that starts flooding your toilet, sink, or bathtub. While you may not be able to stop every drain clog, there are steps you can take to prevent most clogs and nasty backups. Here are a few tips on preventing clogged drains. Catch Hair Before it Reaches the Drain – Hair and soap will often combine in your tub or shower drain to create a clog in your drain. Avoid this by catching the hair before it reaches the drain. Various sizes of mesh screens are available to prevent hair from going down the drain. Don’t Dump Grease Down Your Drains – One of the worst things you can pour down your drain is grease. 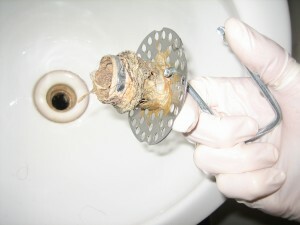 Warm grease runs down your drain until it cools in the pipe, where it congeals to start forming a clog. Then other stuff gets stuck in it, and before you know it you’ll need a drain cleaning. Collect Your Food Waste – Grinding up food in a disposer and sending it down the drain is convenient, but it can clog drains. a Safer and more eco friendly idea is to add your organic waste to a compost pile. Many cities collect organic waste for composting, but if yours doesn’t, consider building your own compost bin. Avoid putting meat or other greasy food in the compost bin because it takes too long to break down. Don’t Rinse Cement, Grout or Joint Compound – Settling-type joint compounds harden by a chemical reaction and will set inside your pipes. If it settles in your drain then you’re in for a rock-hard clog. Sand is another building product that is notoriously bad for drains. Sand is heavy and settles quickly in traps and pipes to form clogs that are difficult to remove. Keep Your Pop up Stopper Clean – The pop-up stopper on your bathroom sink is a magnet for hair, dental floss and other build up. It is a good thing because it keeps all of that gunk out of your drains. However, allowing this waste to build up for too long can cause the sink to drain slower and slower and eventually not empty at all. Remove the stopper and clean it when you start noticing your sink draining slower. Use Bacteria to Break it All Down – Whether it’s hair, grease or food, some sort of organic matter causes most drain clogs. Fortunately, there’s a type of bacteria that breaks down organic matter in your drains. Add the bacteria to your drains and it will consume organic matter which helps prevent clogs. You can buy drain-cleaning chemicals in granular or liquid form at most shopping centers. Even taking all these tips into account, there will still be times where your drains get stopped up and you’ll still need a drain cleaning. If you require an emergency drain cleaning then Midwest Flood Restoration is at your service. We’re available 24 hours a day throughout Webster Groves and the surrounding areas for all your drainage needs. Our drain cleaning services provide everything you need to get your drains back in working order. Our team has the skill and technology needed to ensure your drain system is handled perfectly. We also provide all information in a clear and friendly manner. Don’t let a small drainage problem turn into an expensive repair! Even the smallest of clogs need to be treated with the utmost care, which is why you should rely on the professionals at Midwest. As a suburban municipality, Webster Groves has its origins as five separate communities along adjacent railroad lines. Since then, Webster Groves’ tree-lined streets and abundance of single family homes have continued to attract people to the area as a “great place to live, work and play”, not solely for the wealthy commuter suburb that early developers envisioned but for families that cut across all socioeconomic lines. The geographic and economic diversity of Webster Groves is evident in its variety of neighborhoods. Today, Webster Groves is home to attractions such as the Webster Groves Public Library. We provide drain services throughout Webster Groves, MO including 63119.